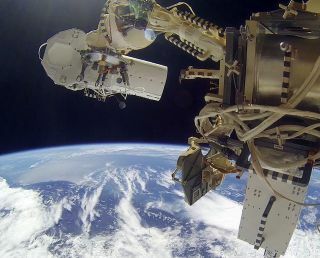 GoPro camera view of UrtheCast's high- (upper left) and medium-resolution (lower right) commercial video cameras mounted on the International Space Station. It was 'take two' for the installation of commercial video cameras on the outside the International Space Station Monday (Jan. 27), as Russian cosmonauts ventured out on a second spacewalk to add the two Earth-viewing cameras to the orbiting outpost's exterior. But despite getting both of the cameras properly installed again, the two cosmonauts had to return inside the space station without one of the cameras returning a good signal. Expedition 38 commander Oleg Kotov and flight engineer Sergey Ryazanskiy opened the hatch to the station's Pirs docking compartment at 9 a.m. EST (1400 GMT), starting their second spacewalk in a month aimed at installing the cameras for Vancouver, Canada-based UrtheCast Corp. According to NASA, the high-resolution camera was found to have an internal wiring problem. The second of the two cameras, the medium-resolution unit, was thought to have had its external cabling inadvertently routed to the wrong connection terminal. Monday's spacewalk saw the cosmonauts reinstall the two cameras on a biaxial pointing platform previously added to the space station's Zvezda service module. The 6-hour, 8-minute extravehicular activity (EVA, or spacewalk) also included Kotov and Ryazanskiy retrieving a cassette for a Russian materials exposure experiment and a NASA foot restraint mounting fixture from the Canadarm2 robotic arm that had a loose connector pin. Russian flight controllers were able to confirm that one of the two UrtheCast Earth-observation cameras, the high-definition unit, was transmitting a good signal before Kotov and Ryazanskiy returned into the space station at 3:08 p.m. EST (2008 GMT). The status of the medium-resolution camera however, was unknown. The two cosmonauts tried reseating the external cabling leading to the camera but needed to wait until they were back inside the station to gain access a panel in the Zvezda service module to determine if the telemetry from the camera was steady. Regardless the outcome, ground controllers advised Kotov and Ryazanskiy that there would not be a third spacewalk to work on the cameras. According to the UrtheCast website, the company intends to use the cameras to "stream unprecedented footage" of the Earth to anyone with an internet connection. "In near real-time, you will be able to visit your favorite locales and learn about current events as they unfold," the company advertised. UrtheCast's chief executive Scott Larson stated in media interviews prior to the December spacewalk that their plan was to begin offering sample still photos from the medium-resolution, fixed-view camera by this spring. The company later plans to offer free internet streaming of a continuous view of the Earth from the vantage of the space station. The commercial use of UrtheCast's 4K "ultra-HD" camera will follow after a commissioning period expected to take a few months. The fixed-view, medium-resolution camera will be able to resolve targets that are about 16 feet (5 meters) across or larger and will record 25-mile-wide (40 kilometers) strips of imagery showing the Earth 260 miles (420 km) below. The high-resolution camera will be able to make out objects as small as 3.3 feet (1 meter) across. Cosmonauts Oleg Kotov and Sergey Ryazanskiy, as seen during their Dec. 27, 2013 spacewalk to install two UrtheCast cameras. The pair repeated the spacewalk Jan. 27, 2014 as a result of wiring and cabling issues with the cameras. The delay installing the pair of cameras is not expected to hold up UrtheCast's plans. "At this time, the company expects that there will be little or no material impact on its business plan for 2014," the company's officials stated after the first spacewalk. Monday's spacewalk marked the 178th EVA in support of the assembly and maintenance of the International Space Station. The outing marked Kotov's sixth career EVA and the third for Ryazanskiy. In addition to their first attempt at installing the UrtheCast cameras, Kotov and Ryazanskiy also conducted an EVA together in November, during which they carried outside a torch to be used as part of the opening ceremonies of the 2014 Sochi Olympics on Feb. 7.